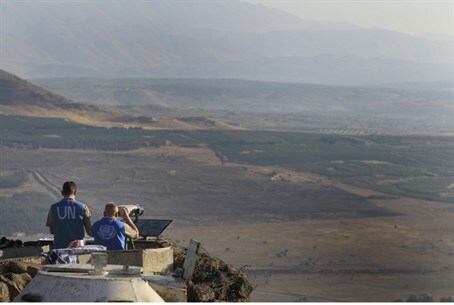 A mortar shell fired from Syria fell on the Israeli side of the border fence on the Golan Heights Wednesday afternoon, security sources said Wednesday night. The incident occurred near the Tel Azeka IDF post on the Golan. IDF sources said that they did not believe that the shell was fired on purpose, but was a stray shell that was misfired by either government or rebel forces engaged in fierce fighting on the Syrian side of the border. An IDF official said that Israel has informed UN peacekeepers of the incident. A report Wednesday night said that the UN was planning to increase its forces on the Syrian side of the Golan, due to the battles going on in the area. The UN forces will bring in extra tanks and armored vehicles. In addition, the forces may add several security and political advisors to their group in order to make better and more efficient decisions in real-time, given the volatility of the situation in the region, a UN spokesperson said. Earlier, reports said that Syria was seriously considering using chemical weapons against rebels, who have been gaining the upper hand in many areas of the country. Speaking Wednesday after a meeting of NATO country foreign ministers, U.S. Secretary of State Hillary Clinton had a stern warning for Damascus, saying that use of the weapons would be a “red line” that the U.S. would have to actively respond to. “Our concerns are that an increasingly desperate Assad regime might turn to chemical weapons, or might lose control of them to one of the many groups that are now operating within Syria," Clinton said. "And so as part of the absolute unity that we all have on this issue we have sent an unmistakable message that this would cross a red line and those responsible would be held to account,” she added.